So, if you're like me, and would rather do your shopping online, then you really don't want to miss these 12 awesome kids' Halloween party supplies. 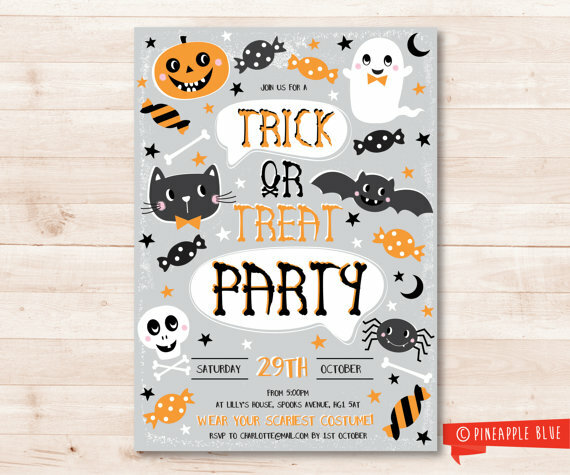 Give your little guests a taste of the fab Halloween party you'll be throwing with this fun trick or treat party invitation. The illustrations are so cute that kids will love them! Kids love Halloween, and naturally all the candy that comes with it, so it's not surprising they spend all October asking you how many more days until Halloween. 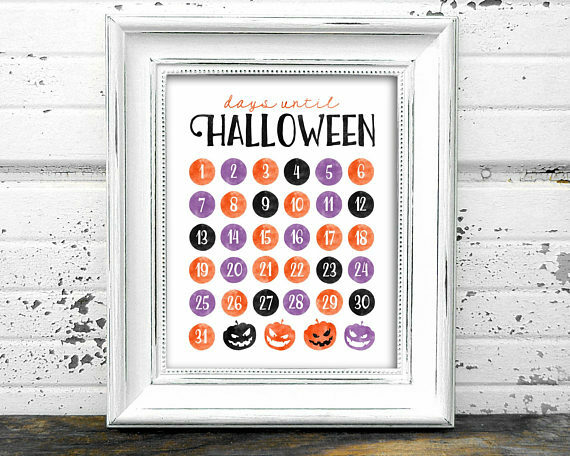 Make your own life a little easier and let them have fun counting down the days on this awesome Halloween countdown calendar. It's a great Halloween decoration idea! Cute cake toppers aren't easy to come by, but this boo bunting cake topper is just adorable! Love the little black tassels on the end. It's simple way to finish off your cake with hardly any work. Just perfect! 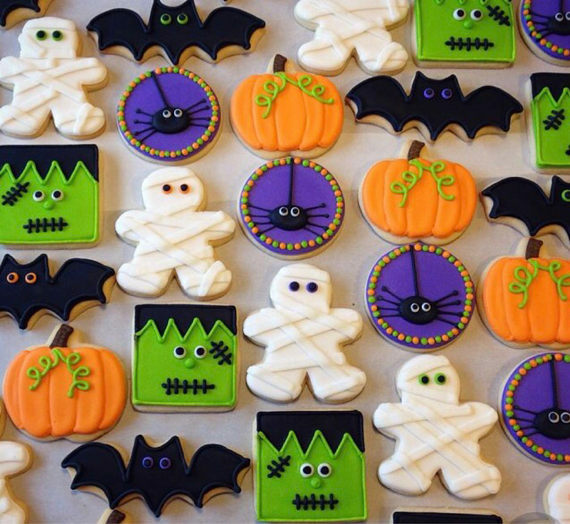 Fill a plate with all these fun and colorful Halloween themed cookies. Kids will love taking a bite out of a mummy or a bat, and they'll look great on your dessert table. 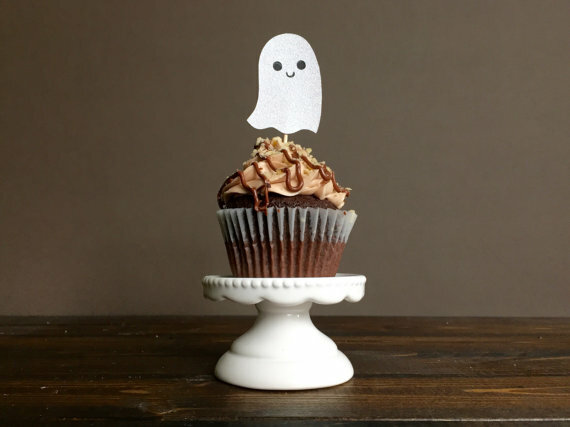 Decorate simple cupcakes with these adorable little friendly ghosts cupcake toppers. A quick and easy fix for you this Halloween. 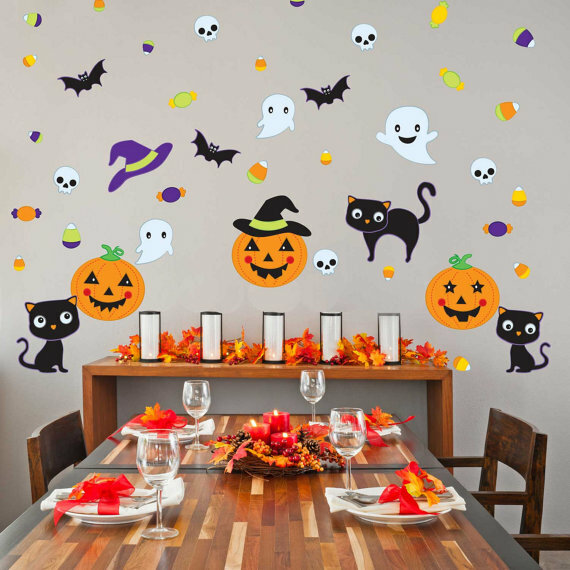 For the perfect Halloween decoration fill the wall behind your dessert table with this awesome mix of Halloween themed decals. You can place them whatever way looks best, and they'll definitely lighten up your room. 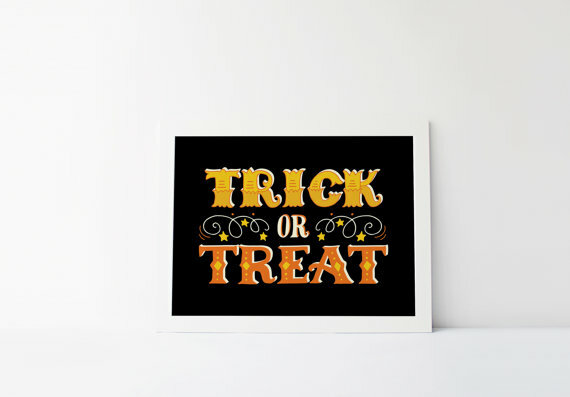 Trick or treating is the highlight of any kids Halloween party so let other kids in your neighborhood know you've candy for them too, with this cool 'trick or treat party sign'. Perfect to place up against your window so everyone can see. Decorate a bunch of party balloons with true Halloween flare for the ultimate DIY halloween decoration. 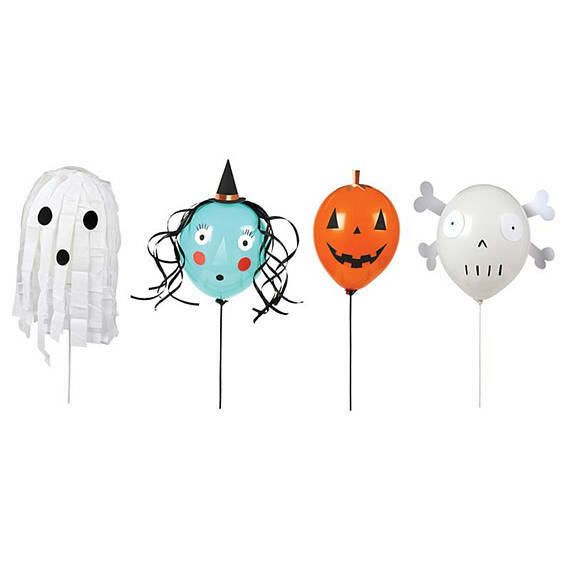 You'll be having fun transforming them into ghosts, witches, Jack O Lanterns and skulls and they'll look fantastic scattered around your room! 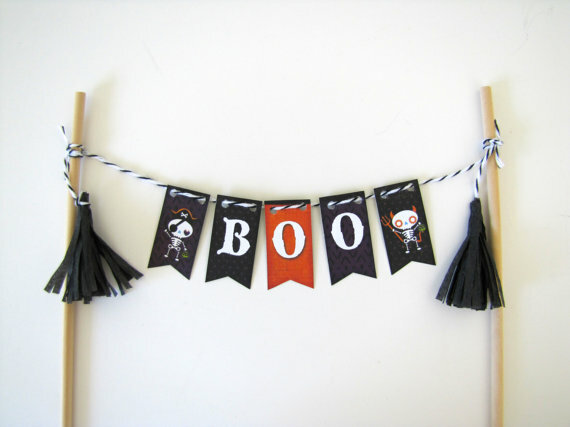 Decorate your dessert table, or even hang this cute Halloween banner up against a wall, to add that extra Halloween touch you'll be looking for. It's such a cool Halloween party decoration! 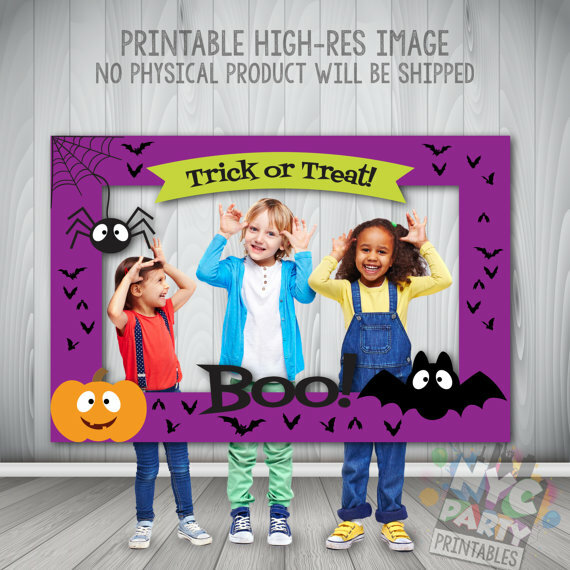 A cool kid's Halloween party idea is this fab Halloween photo booth frame that will help you create lots of special memories. Kids are sure to have fun and your photos will surely be a laugh! 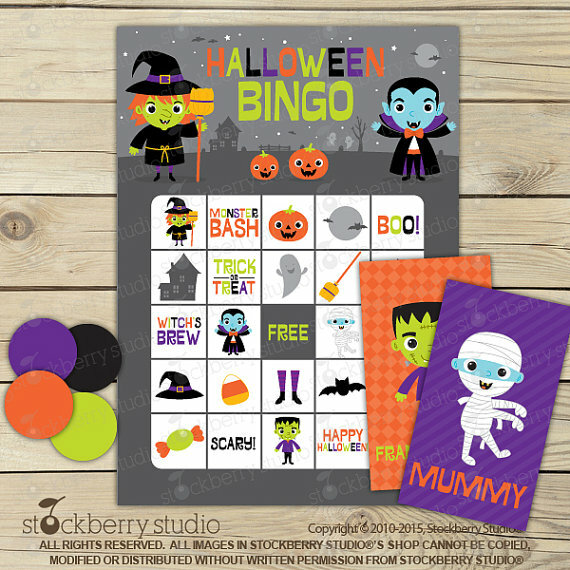 Keep your little guests busy with this great Halloween Bingo party activity. The illustrations are so much fun, that I'm sure kids will love them! 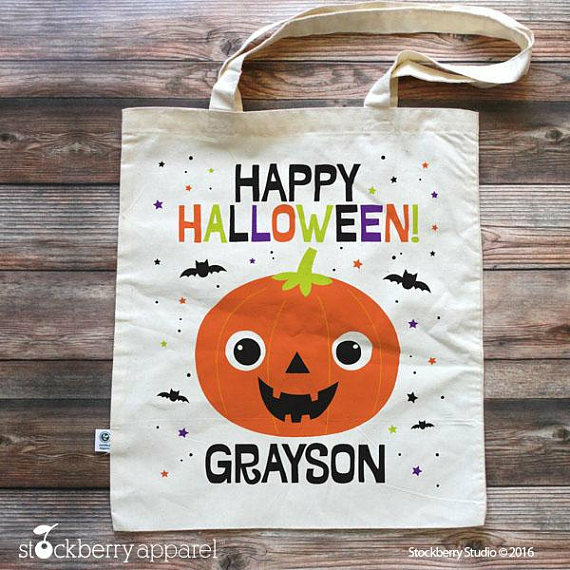 Treat your kids' friends to these adorable personalized trick or treat party favor bags. Imagine just how delighted they'll be walking around filling them up with delicious candy. MORE HALLOWEEN POSTS YOU'LL LIKE! 10 Scary Halloween Parties - Must See! 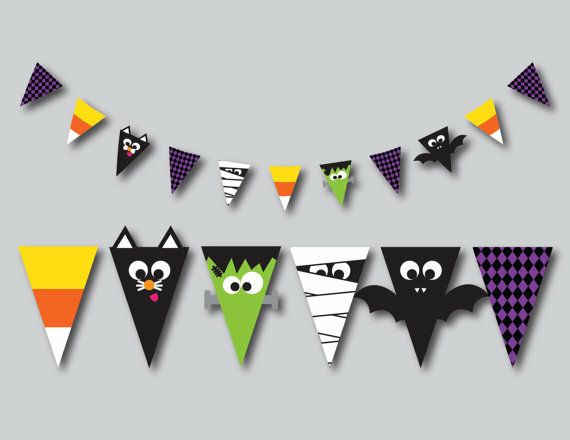 Need Halloween free printable decorations? Need more Halloween recipe ideas? Make These Quick and Easy Halloween Pretzel Rods! Cookie Dough + Halloween Mummies = Yum! A Halloween Treat So Cute, It's Scary! Need more Halloween craft ideas? The Easiest Scariest Halloween Decorations! 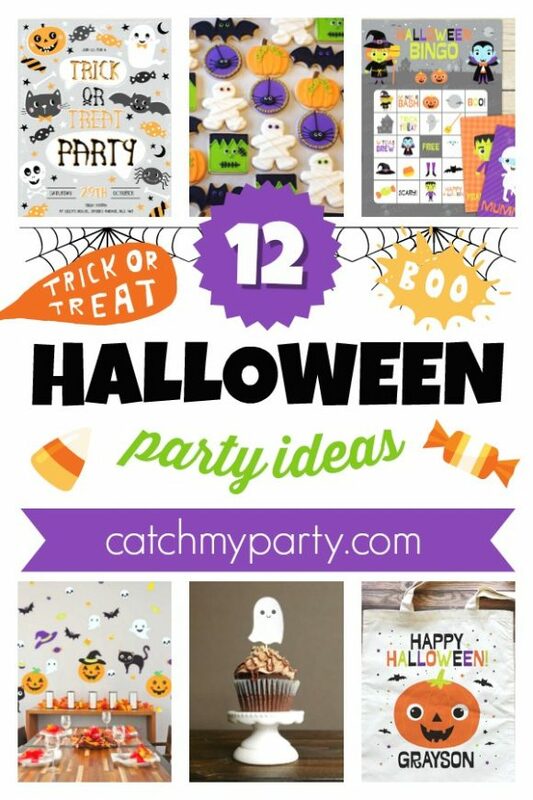 For more inspiration, check out all these spooky Halloween parties on our site, and check out these Halloween party supplies from vendors with listings on Catch My Party! **Some of these links may be affiliate.